Kinabalu Park is a 2 hour drive from Kota Kinabalu city. It is a popular destination for adventure seekers who want to climb Mount Kinabalu, Southeast Asia’s highest peak at 4,095 meters. 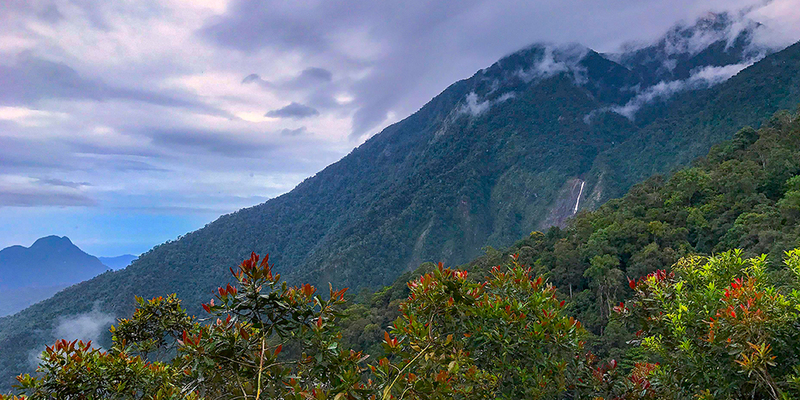 The surrounding rain forest of Kinabalu Park is 75,370 ha of land that is home to a rich diversity of plants and birds, making it a haven for nature lovers. The park became a UNESCO World Heritage Site in 2000, making it Malaysia’s first. Other than climbing the mountain, the park has 9 different hiking trails to choose from. There are also viewpoints to look out from and enjoy sunsets and sunrises. 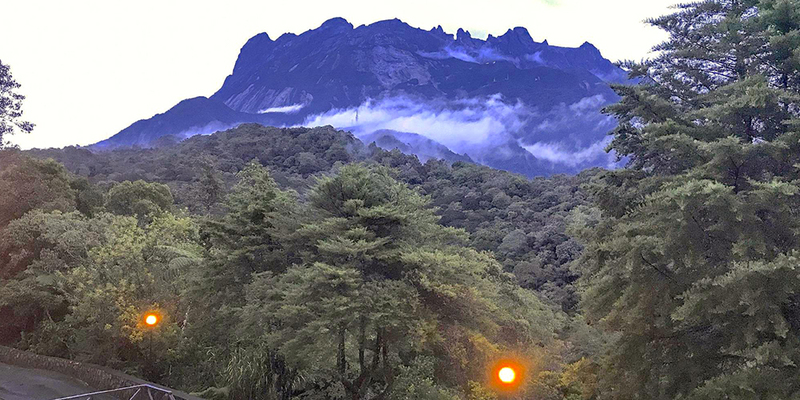 Here’s how to spend a weekend at Kinabalu park. Kinabalu Park ranges in altitudes from 152m at its lowest point all the way up to 4,095m at its highest at the top of Mount Kinabalu, one of the highest in Southeast Asia. The climate therefore ranges from tropical to alpine conditions at various degrees. So while it may be tropical in the day or at the start of your hike, it can get cooler at night or as you ascend the mountain. So be prepared and bring a warm jacket. 7 or 8pm: Arrive at Kota Kinabalu airport. Get picked up by the hotel and travel to Kinabalu Park. It is a 2 hour drive. Have a late supper or snack at the hotel and prepare for next day. There are two main restaurants within the park: Balsam and Liwagu. Liwagu serves a la-carte dishes while Balsam serves Buffet-style breakfast. The climbers usually have breakfast at 6-7am before they begin their ascent. Arrive at 8am and you will have the place to yourself. The international buffet serves a wide variety of local, Western and Chinese food. Our favourite was the fried red bean buns, a traditional Chinese bun deep fried that has a crunchy texture. Organise a guide with Sutera Sanctuary Lodges. The walk to the waterfalls is not open to public access so it requires entry through Timpohon Gate and you need to have a guide. You will take the path with other hikers, and head down first for 5 minutes before reaching Carson Falls. The waterfall is the first feature that many climbers see and they are almost always grateful to see this fall again on the way down because it means that they are near the exit! While the waterfall is laced with vines and moss; the scenery around it makes the trip worthwhile. You can also fill up your bottles from the falls. 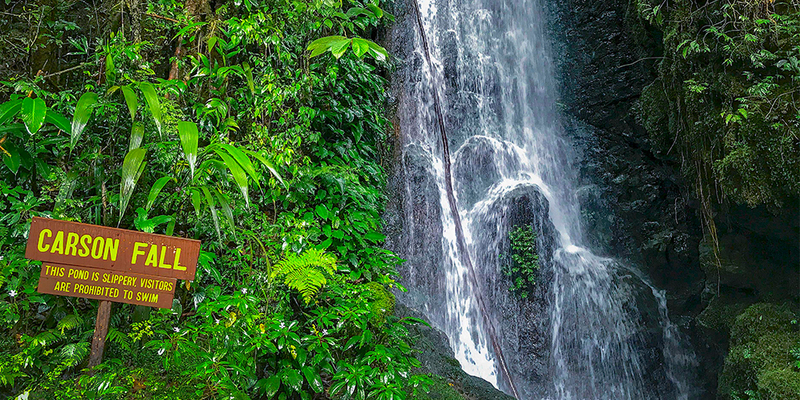 The waterfall was named after the first warden of Kinabalu Park. This memorial is on the way down from Timpohon gate entrance. The memorial was initially built as a viewpoint before the 2000 earthquake. The earthquake of 6.0 magnitude shook Mt Kinabalu, killing 18 mountain guides and climbers, 10 of which were Singaporean. It has since been converted to a memorial site to commemorate the 18 victims. You can see the slopes of Mt Kinabalu from here. After a rainy day, you can see the waterfalls coming off the slopes. Liwagu restaurant serves a la carte dishes. They have a selection of local and Western dishes. Try the Tom Yam Seafood soup or Nasi Goreng, they are packed full of fresh vegetables sourced from the local Kundasang vegetable markets. 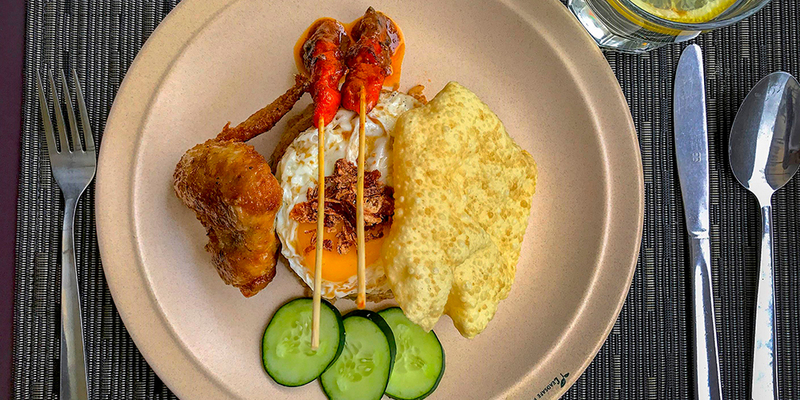 The fruit and vegetables served at both the restaurants mentioned above are sourced from local farmers at the Kundasang markets. Arrange for the hotel to drop you off at the Botanic Gardens. You can also choose to walk, it takes 15 minutes. The Botanic Gardens is owned by Sabah Parks, the main government organisation that overlooks Sabah’s National Parks. Entrance fee is Rm5 for non-Malaysians and Rm4 for Malaysians. The highlight of the walk through the Botanic Gardens is the orchids. 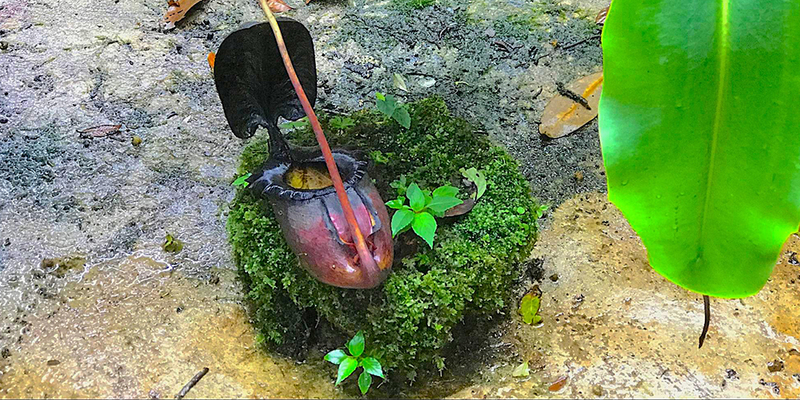 The park rangers have painstakingly sourced orchids from the region and grown them in this gardens as part of an education and awareness program. Your guide will point out the smallest orchid in Borneo(<1cm), as well as the 4th most expensive orchid in the world (USD5,000 per stem). Here you will also find the 4 largest species of Pitcher plants that are only found in the Kinabalu area. To see them naturally in the wild, you will have to hike overnight for 3-4 days. There are a few species in the gardens that are used for breeding and educational purposes. Pitcher plants are carnivorous plants, that grow ‘cups’ to hold nectar and water that attracts insects. The sides of the cups are slippery, and cause insects to slip into the nectar solution, providing food for the pitcher plant. Request this with Sutera Sanctuary Lodge staff beforehand. 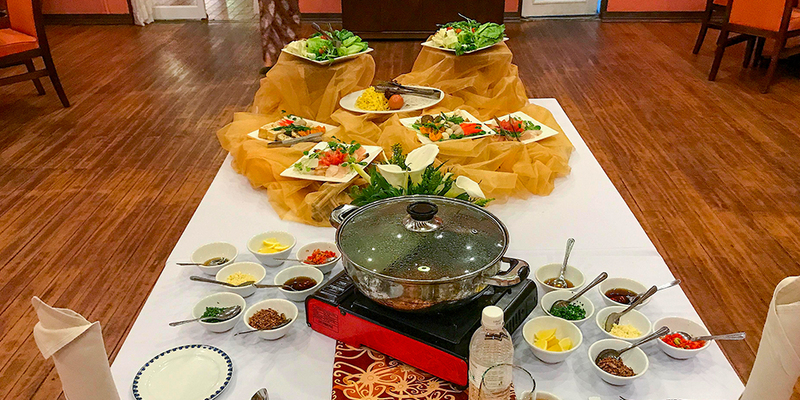 The chef will prepare you a delicious steamboat dinner with plenty of fresh vegetables sourced locally from the region. Do not miss this! From Liwagu, you can walk down to the start of the trail in 15 minutes. The Silau Silau Trail is an easy trail that is most frequented by visitors as there are many entry and exit points. It is 3km but flexible, you can decide how far you would like to go. The trek is flat, follows a stream and is covered in moss, fern and wild orchids. There is a guided walk by the garden park rangers at 11am. We recommend doing this walk with them as you will learn a lot about the plants. They will share how they use various plants as medicine, furniture and even pillow stuffing. We learnt that the forest provided a lot of raw materials for early humans to survive. These rangers have a personal connection to the forest, as their ancestors once lived in this environment. This was our favourite hike as it was very informative and we learned a lot about the early hunter gatherers in the area. The buffet lunch is popular for climbers who have just finished the climb. Going for lunch later would mean that you miss the crowds. Organise with hotel staff to take you on a trip to Desa Cattle Farm and the Kundasang Market. It is a 35 minute drive from Kinabalu Park. 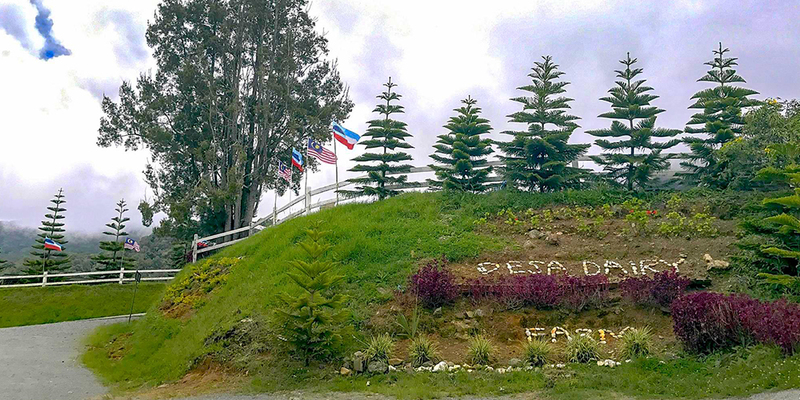 Desa Cattle Farm is a large distributor of milk, yoghurt and cheese in the region. The farm is 199 Ha and holds about 600 cattle imported from New Zealand. Other than cows, they also have a small group of goats, and produce goat’s milk. 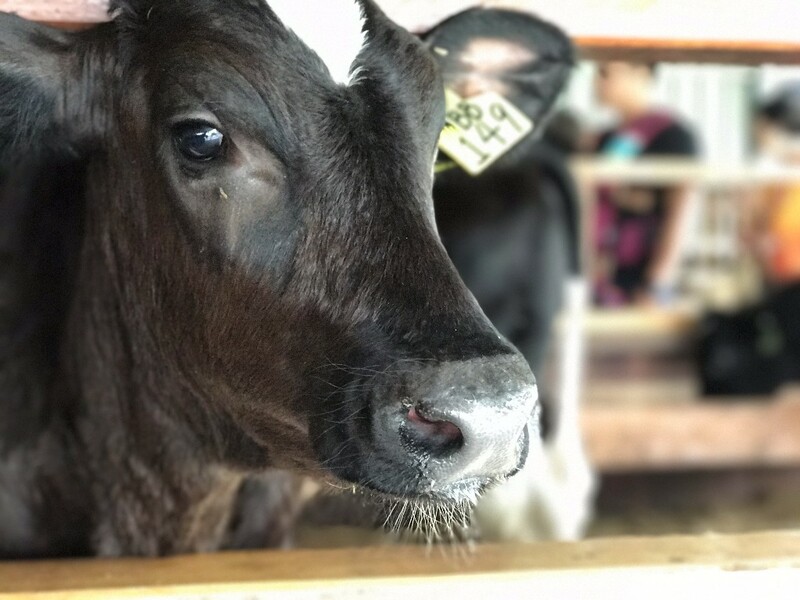 At the farm, you get to learn the processes of making milk and fresh yoghurt. Kids especially love this farm because you get to feed the goats and calves. It is a popular place for visitors because of its picturesque views of the hills as well as the fresh gelato, flavoured milk and yoghurt. Organise with the hotel staff to take you to the Kundasang market. 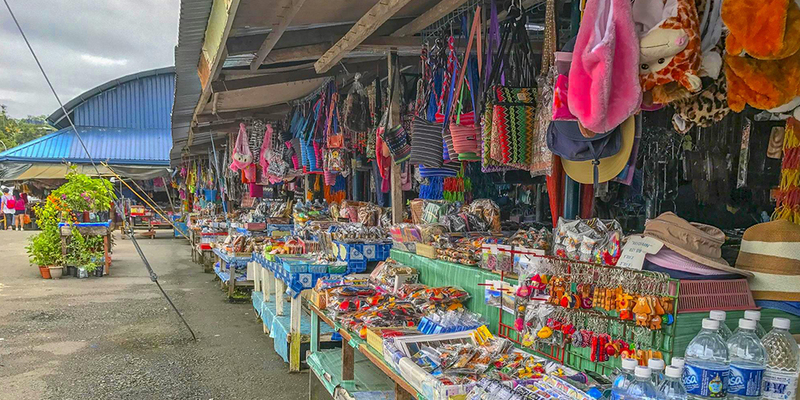 The Kundasang Market is a row of food stalls lined up along the main road selling fresh fruit and vegetables grown in the area. This is where locals and restaurants source their groceries from. The busiest times are early in the morning. There are generally less crowds in the afternoon. The cool climate of the area makes conditions perfect for growing a large variety of fruit and vegetables. Fresh papaya, mango, watermelon and honeydew are among the fresh fruits grown in the region. Be sure to look out for their red and black rice varieties, they are often hard to find in Singapore, but are sold readily here. Organise this with hotel staff. Organise transport with the hotel, they will drop you off at the sunset view. It is located near the entrance of Kinabalu Park. You will get to see the majestic Mount Kinabalu, and if there aren’t many clouds, the sunset light might hit the mountain top for those amazing photos. The scene from sunset viewpoint is amazing so be sure to get there early for a good spot, as it gets crowded. Try the ‘Pulot Hitam’ for dessert. 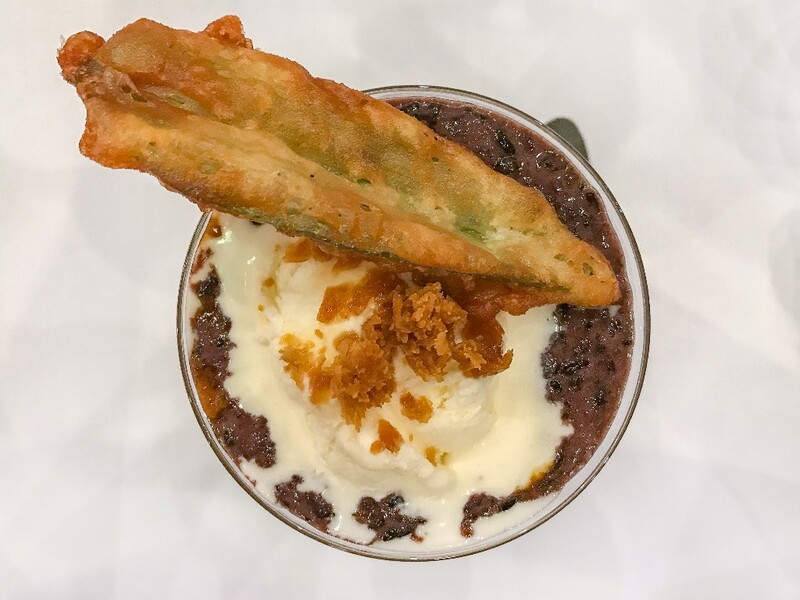 It is glutinous black rice served with vanilla ice cream and topped with a fried pandan (screwpine) leaf! It’s a unique twist to a local delicacy. Have an early buffet breakfast at Balsam restaurant then check out from the hotel. The Nabalu market is a pit stop for locals and tourists. There are rows of souvenir shops, where you can source gifts for your family and friends. The most popular souvenirs are T-shirts with Rafflesia flowers and Mt Kinabalu motifs. They also sell traditional drums and gongs. Our favourite was the beaded necklaces. What many do not know is that there is a view point next to the market overlooking Mt Kinabalu and its neighbouring hills. Stop to take some photos: it is a spectacular view, and great way to end the trip. Singapore n Beyond was a guest at Sutera Sanctuary Lodges which is a member of the Secret Retreats collection. As always, all opinions expressed in this article are our own. Sutera’s lodges are located both inside and outside Kinabalu Park. The lodges inside Kinabalu Park are close to the trails. Sutera also offers a variety of accommodation options that are located just outside the Hot Springs area. 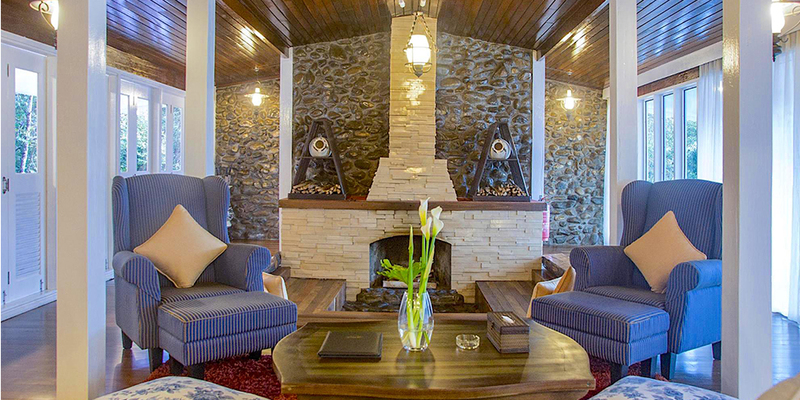 The summit lodge comes with 2 bedrooms, private bathrooms, dining area, pantry, lounge and fireplace. 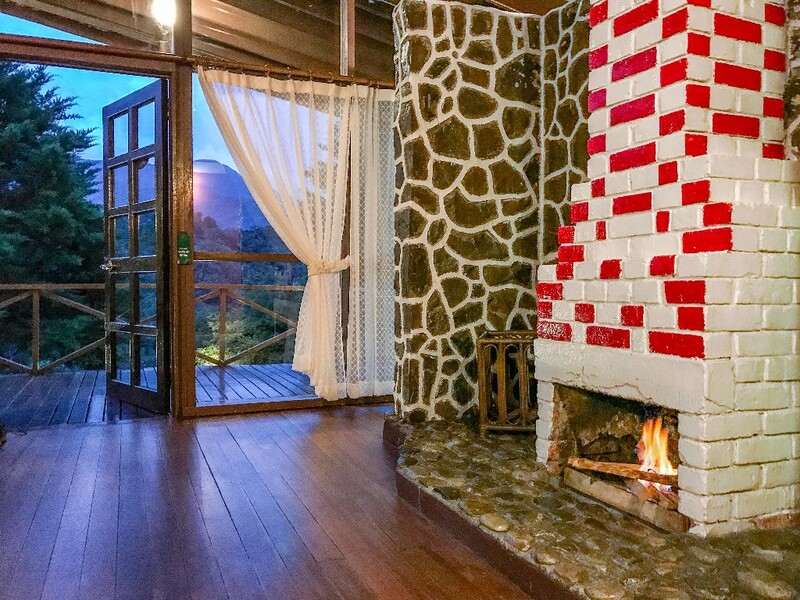 The Peak Lodge has 2 bedrooms, shared bathroom, pantry and a spacious lounge area complete with a fireplace. The Grace hostel provides bunk beds with shared bathroom and shower heater. There are 2 direct flights departing Singapore daily operated by SilkAir and AirAsia. Both depart in the evening, and arrive in Kota Kinabalu city at night. AirAsia flights depart at 17:35 and arrive Kota Kinabalu Airport at 20:00, flights cost between SGD70 and upward. SilkAir flights depart at 16:25 and arrive at 18:50, and cost SGD200 and up. You can have the perfect getaway on a Friday evening and arrive back in Singapore on Monday evening. If you are staying with Sutera Sanctuary Lodge, you can request transport anywhere within the park by calling reception from your room. Staff are also available to coordinate pickup and drop offs within the park area. Walking is another option. There are paved tracks along the main road in the park, and most of the amenities and hiking tracks are within 15 minutes walking distance. February to April is the best time to visit, as they are non-monsoon months and rainfall is scattered. Avoid October to January as it brings frequent, heavy rains.